NEW YORK, NY -- Kyle Garland is golden once again. 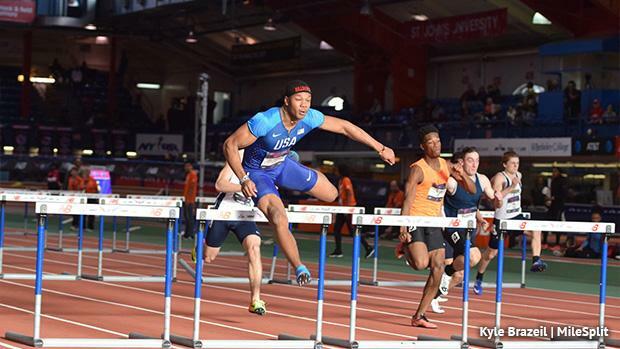 The multis star and Germantown Academy senior repeated as New Balance National Indoor champion in the Championship Boys' Pentathlon. Garland won last year as a junior and scored 4,169 points this time around, a 19-point improvement on his 2017 total. North Allegheny's Ayden Owens placed second with 3,969 points. Owens started off the day winning the 60-meter hurdles in 7.77, while Garland was second in 7.86, as the PA pair established an early gap on the rest of the field. Garland pulled out an indoor PR in the long jump with a jump of 23-02 and took the lead. Then came the shot put, where Garland tossed a nice throw of 53-05.5. Owens posted a strong PR of 50-09.5 despite using all his attempts in a short period of time because of a schedule conflict with the Championship 60-meter hurdle trials. Garland was square int he driver's seat at that point. In the high jump, Garland cleared 6-04 and Owens jumped 6-02.75. To close the meet out in the 1,000 meters, Garland went 2:54.93, a new PR, to solidify his victory. In the Championship Girls' Shot Put, Berwick's Payden Montana took home second place in a very close competition. Montana, the indoor state champion from a few weeks ago, threw 47-02.5, just 3.25 inches off the winning throw by Zyra Thomas (NJ). Athens Area's Breana Gambrell closed out what was her first full season of competing indoors on a high note. The senior jumped 19-11 on her final attempt to place fourth in the Championship Girls' Long Jump. After Caleb Johnson set the stage on Friday night with a meet record-setting effort in the pole vault, things were bound to heat up on Saturday for PA vaulters. And they did just that. In the first of two sessions of the Championship Boys' Pole Vault (results are combined at the end), West Chester Rustin's Charles Dever PR'd not once, not twice, but THREE times. Dever eventually jumped 16-5.25, which is also a new PA#1. After the second session that held for sixth place, giving the senior All-American status. East Pennsboro's Payton Morris also PR'd, placing eighth overall with a jump of 16-01.25. The Penn Wood SMR came away as All-Americans despite coming out of the first of six sections. The Patriots ran a time of 4:07.02 to grab sixth place. In the Championship Boys' Shot Put, Bradford Area's John Eakin took 12th with a throw of 57-00.25. LaSalle's Jonathon Squadrito cleared 13th in a competitive Championship Boys' High Jump with a jump of 6-07. In the Championship Girls' Pentathlon, Cheltenham's Brianna Smith scored 2,368 points to take seventh place. Oakland Catholic's Jayla Ellis was tenth with 3,123 points. The final day of competition is set for Sunday with plenty of Championship finals and surely plenty of fast times and big marks.